Welcome to the Apogee Element Series Video Tutorials. In this video, we’ll show you how to enable I/O Labels in Logic Pro X so it’s easier to identify the input and output channels of your Element interface. For all inputs, change the selection to “Provided by Driver”. You can click and drag over all the labels to change this setting all at once. Now when you choose an input or output in your Logic track, it shows the descriptive label from Element making it much easier to route your signal. By the way, You can do this same thing with any of Apogee’s family of USB and Thunderbolt interfaces because they all provide descriptive labels. 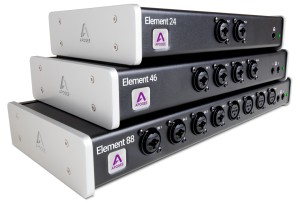 It’s yet another touch of the Apogee Advantage. For more helpful videos on using your Element Series Interface and Element Control software, check out the additional Element Series Video Tutorials.